Ford recently revealed that it has an "entry-level" performance Ford Mustang in the works, and one of our spy photographers may have caught that very car. Although this 'Stang is completely uncovered, it's actually difficult to tell exactly what we're looking at. The car has a California Special grille, and the badges have been taped over, so there aren't any obvious indications of what powertrain it has. But there are some other details that lead us to believe this could be a new performance edition of the entry-level Mustang. Among those features are fairly wide 19-inch wheels and a chin spoiler that seems deeper than the one included with the Performance Package 1 (PP1 for short) on Mustangs. Both the large wheels and spoiler seem indicative of a feature set like that of the Performance Package 2 (PP2 for short) for the V8-powered Mustang GT. Since Ford has already developed that package for the V8 car, and test mules are for upcoming products, we bet this car has the Mustang's four-cylinder under the hood. An EcoBoost Mustang PP2 would seem like a good fit for the "entry-level" performance car, too. Based on the GT PP2 feature list, a similar list would offer nice upgrades over the EcoBoost PP1 list such as six-piston front calipers, standard magnetic shocks, extra bracing and the aforementioned wider tires and deeper front spoiler. 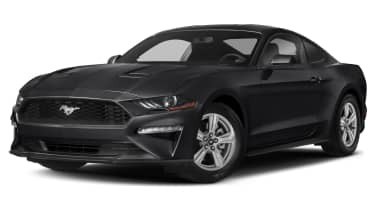 This hypothetical EcoBoost PP2 would also be able to slot under the price tag of the base Mustang GT, keeping either model from cannibalizing sales. Something that doesn't come with the Mustang GT PP2 is any kind of power increase, and that could mean an EcoBoost PP2 wouldn't get a power bump either. That would be a bit disappointing, since even though an EcoBoost PP2 would probably still be cheaper than a GT, it would be nice to close some of the gap between the GT's 460 horsepower and the EcoBoost's 310 hp. That gap could be closed at least a little if Ford included an ECU calibration like the aftermarket Ford Performance kit for 2015 to 2017 Mustang EcoBoost models. That kit added a high-flow filter and engine tune that bumped the old model's power by 25 horsepower and 70 pound-feet of torque. That kit was also legal in all 50 states, and something like that in a new EcoBoost PP2 would be a sweet package. This is a lot of speculation, but we don't think we'll have to wait long for the official details. We expect the "entry-level" performance Mustang to be revealed at the New York Auto Show.